The market got sick today,down 500 points. It's about to get a lot worse. 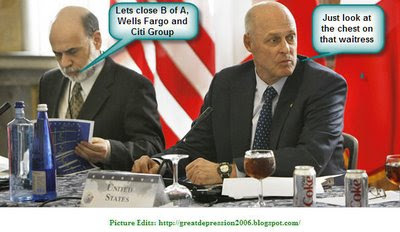 AIG needs 40 billion dollars for cash flow. Kind of makes you wonder where you would get that amount of money or why you would need that much. That is twice what our three major car companies are worth in stock value. A tremendous amount of money has vaporized and who has lost it is still a question. I submit that we know who lost it and it wasn't Joe Six Pack (Joe's never saved a dime in his life). The Fed is going to meet tomorrow to discuss lowering the Fed Funds rate. Could be a real waste of time. Look for world interest rates to jump up to 10 to 15 percent in the very near future. Previously bought 30 year Treasury Bonds could be discounted drastically to raise cash. Could be a real buying opportunity. Cash is king. Notice how little of it is around. Those companies that don't have it, are biting the dust. The money that has been lost, has been lost by people with savings. So far, only banks and financial institutions have lost money. Just wait till you get your retirement bank statement at the end of the quarter. You'll notice the money they lost, was your money. Today's Wall Street Journal (Saturday September 13 page B8 and B9), under legal notices there is a rather large group of Mortgage Pass Through Certificates up for auction. Here's a snapshot of the first 30 of 132 for September 17th auction. Most of it is 30 and 40 year paper written in 2006. Double click for a bigger view. You can Google a CUSIP Number and get more info. Here is a Link that describes how they put these things together. 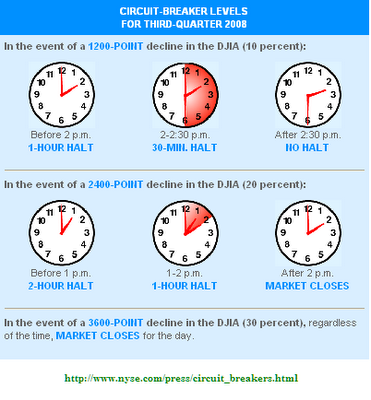 Notice the date on the link is Oct 24, 2006. The package in the link was about 1.5 Billion. So each of the listings above is a portion of an original package. Investors were waiting in line to buy these. This particular package was made up of 1775 loans with 71 percent originating in California. These are probably loans that are about to reset---talk about bad timing. I don't know how the auction handles bidding. I would guess that there is a minimum bid set for each security. I don't see many bottom feeders wanting to jump into this auction. As I have pointed out before, people that need to raise cash, sell the good stuff first hoping the bad stuff improves with age. You get stuck in the end. This is stuff begging to be buried in kitty litter. You'd think that someone would mention which investment firm is in a desperate selling mood. Maybe we ought to ask Senator Schumer. Most of Fannie’s and Freddie’s loans were of the 80/20% variety or 80% with PMI. The biggest loan that they could have written in California would have been 417K. The 20% down or second would have been 104K. Out here the last 2 years, 521K wouldn’t even get you a house with indoor plumbing. Most of the stuff in this area was going for 600K to 1.2 million at the peak. 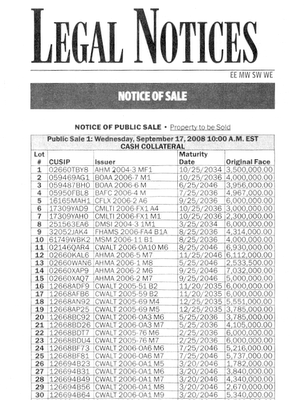 So there are a lot of interest only loans that Fannie and Freddie couldn’t touch that were sold to "someone." Add all of the real non GSE loans together and try to give it a name, it won’t be Freddie or Fannie. There is a lot of stuff floating in this swamp; HELOC’s, second trust deeds, interest only loans and other stuff with a bad fish smell. Billions of dollars worth of real estate in foreclosure are managed by local banks for owners unknown, that can’t even follow through on a short sale. For a joke, assume 9 out of 10 banks in California are insolvent (Ben might snarf his coffee on that one). The FDIC is in no position to fiddle with foreclosures. The Feds look at the banks balance sheet and if it doesn’t pass, they’re toast, the bank will close. Until the other day, the Fed had no structure in place to process foreclosed real estate loans. What's stopping them from transferring bad home loans at a failed bank to Freddie and Fannie? This is pure conjecture on my part. The Fed could use the GSE’s infrastructure to unwind the bad real estate loans held by failed banks. Guarantee the junk, throw it out and if it comes back, nothing lost, the Fed was already stuck holding the bag. This could add liquidity to the market, oh goodie! One thing is very apparent. A tremendous number of loans have been written that have nothing to do with Freddie and Fannie. This doesn't even include outright fraud which could double the size of this mess. But yet only 11 banks have failed? Common sense suggests that this is absurd. Two of the biggest real estate conduits have been taken over??? And the banks had no part in it? Then there was Bear Sterns and Countrywide; they are long gone and forgotton. All of these institutions were upright solid pillars of the community one day and bankrupt the next. Do you get the idea that we are being supplied with "very selective" information? The government guarantee has taken the risk out of mortgage securities. 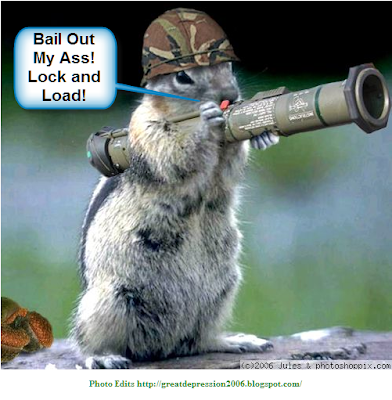 Fannie and Freddie are going to be force fed new loans to “stimulate” the housing market. That’s probably why they were taken over in the first place; they stopped buying the real crap (if the GSE’s don’t buy it, the Fed gets to eat it when they close the banks). The Fed confiscated Freddie and Fannie and everyone that had a short position got paid 6 dollars a share. Of course if you owned the stock, it was your 6 dollars that got kissed good-bye. After an event like that, why own any bank stock? The rest of the world probably feels the same way towards U S real estate paper. This is their second chance to get out. It didn’t take a hurricane to create this mess, but just look at the damage. The smell of garbage is real. August 8th I blogged about how Freddie and Fannie faced bankruptcy in the distant future. Now Bloomberg runs an article saying how obvious it was. I contend it wasn't a damn bit obvious until last Friday, plus the article has very little real anchorage in fact. The GSE's have a problem that is in the future. The Banks have a garbage problem that encompasses 70 to 90 percent of the banking complex TODAY. This crap is on their books and it isn't going away. Fannie and Freddie are country bumpkins compared to this crowd named "Slick" and "Double Dip." The banking system is on the verge of imminent collapse. Here's hoping that your medical plan allows for "Mind expanding drugs." You'll need something to cheer you up as things get worse. The Federal Reserve is going to save Freddie and Fannie? It’s a little like taking your wife in for a brain transplant. She'll argue that it's not really that necessary. 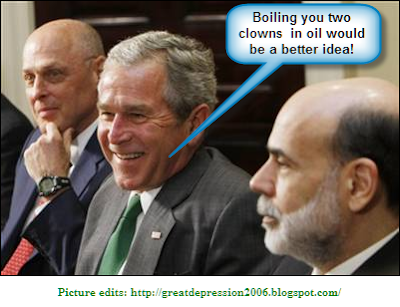 Do you get the idea that Bernanke is up to something? It seems quite suspicious that Fannie and Freddie are really that bad off. They might hold some bad paper, but they probably don’t hold a large amount of crap (second trust deed and interest only loans). This seems more like a ploy to prime the pump for financing housing loans. A government guarantee of Freddie and Fannie gives their paper, grade A investment quality. It's called gilding the lily. Two years from now, this could be reflected upon as an incredibly stupid idea (if the housing market loses another 20 percent of value, the taxpayer could be caught holding the bag, not Freddie and Fannie). The Bernanke-Paulson Car-Wash-Fund-Raiser for Freddie and Fannie is a last ditch effort at getting funding back into the housing market to keep prices from further deteriorating. So far the antics of this dynamic duo seems to have had little effect. Their dropping of the Fed Funds rate did little to keep the mortgage rates down. Home loans are at about 7% and creeping up. There are no home buyers. The banks right now, are still Bernanke’s real problem along with other financial institutions like the hedge funds. Most FDIC insured banks that need cash, raise interest rates. The depositor gets a better deal than T-bills (ING bank is now offering 4% interest). If the bank goes belly up, the Fed gets to pick up the tab. It’s a win, win for the bank. With all of the junk written out here in Kalifornia, you would think that most of the banks in this state, would be on the Feds watch list. This money wasn't pulled out of thin air. The next two weeks could prove very interesting. Interest rates should continue their trek upward. The Asian stock markets appear to be collapsing and it could spread to our markets. What seems to be very apparent, is a continuing contraction of the money supply. Throw in one or two hurricanes and a bank closure or two, that should keep the election off of page one.